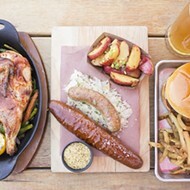 The Frisco Barroom's "Farmer's Board" is a tasty way to grab a snack. There's an old saying in the food business that if you want to make a million dollars by opening a restaurant, start out with two. Indeed, it's a risky industry. The statistics on the number of places that go out of business in their first year are enough to give pause to any prospective restaurateur. Chefs around town will tell you that, though some make a comfortable living, the industry is anything but a get-rich-quick business. Looking around the packed-to-the-gills Frisco Barroom on a weeknight, however, I could not help but think that there needs to be a caveat to that saying for the dining goldmine that is Webster Groves. Perhaps this: If you want to make a million dollars in Webster, find a good spot and rub two nickels together. After all, a restaurant just down the road boasts a wait list rivaling that of the French Laundry. To say that this community has been craving solid dining options is an understatement. It's been salivating, ravenously. 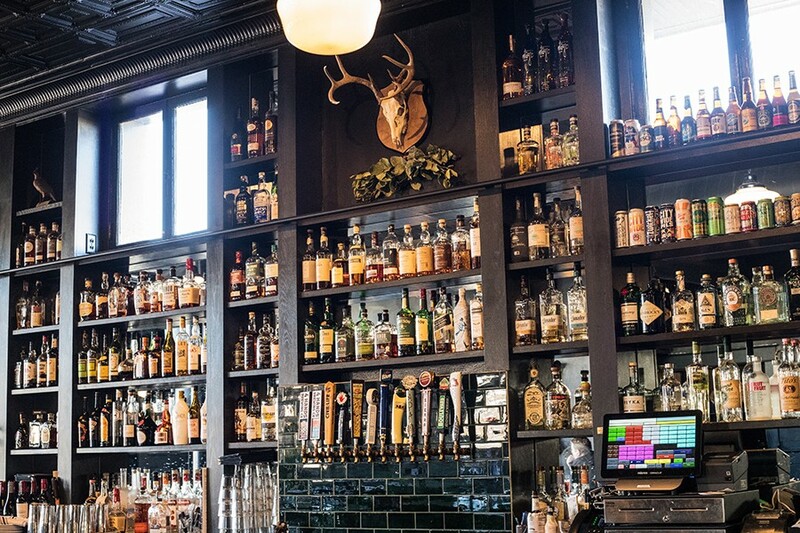 That a place as tailor-made for its neighborhood as the Frisco Barroom has only existed for six months might give you some idea why there's been such demand. Though the area around Old Orchard has a handful of eating and drinking spots — Weber's Front Row, Webster Wok, Hwy 61 Roadhouse and Kitchen, Big Sky Café — it's lacked the obvious: a modern American tavern that is nice enough for date night, but not so nice that you have to call a sitter. The restaurant is huge, but also consistently packed. Enter the Frisco Barroom. 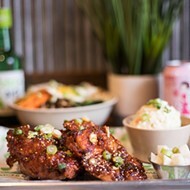 The concept may be a no-brainer, but with thoughtful execution that hits every note, from the food to the aesthetics to the use of space, you'll be forgiven for thinking the place has been here since the city's inception. You'd expect nothing less from the husband-and-wife team of John Barr and Kelly Hall-Barr, whose former endeavor, K. Hall Designs, evolved from a simple candle company into an international home-goods-and-personal-care brand. 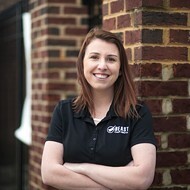 After selling the company in 2015, the pair took some time off to consider their next venture. They knew they wanted to be a part of a community; Hall-Barr dreamt of opening a cozy flower shop while Barr mused about running a pub. Eventually, those ideas took shape, though they evolved into much more ambitious projects. Hall-Barr's flower shop idea became Civil Alchemy, a modern general store selling everything from jewelry to homemade gin. And Barr's idea for a bar — well, it got a whole lot bigger. 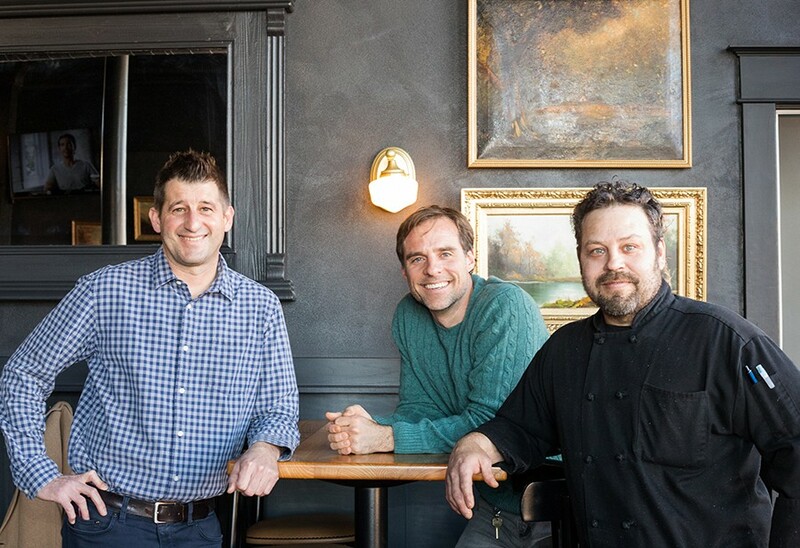 General manager Jon Meinz, owner John Barr and executive chef Tim Montgomery. It got two stories, a rooftop and about half a city block bigger, to be precise. 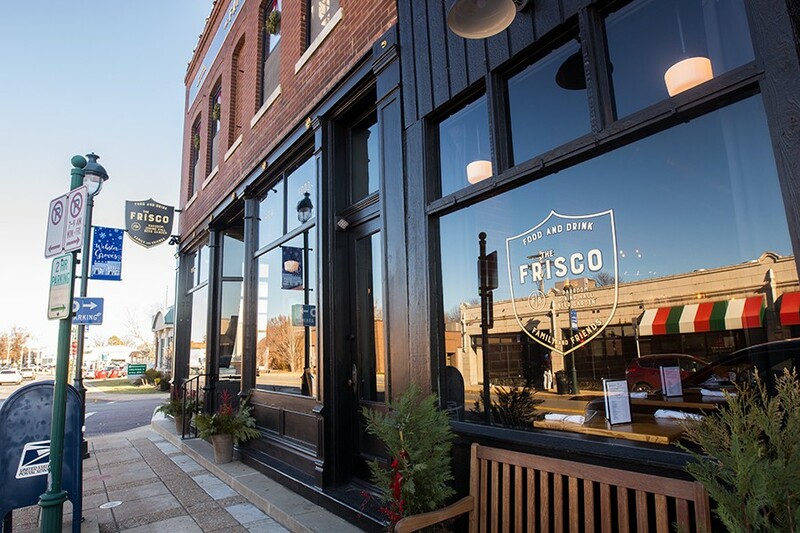 The Frisco Barroom is a large space, taking up the building that used to house the Natural Way grocer. 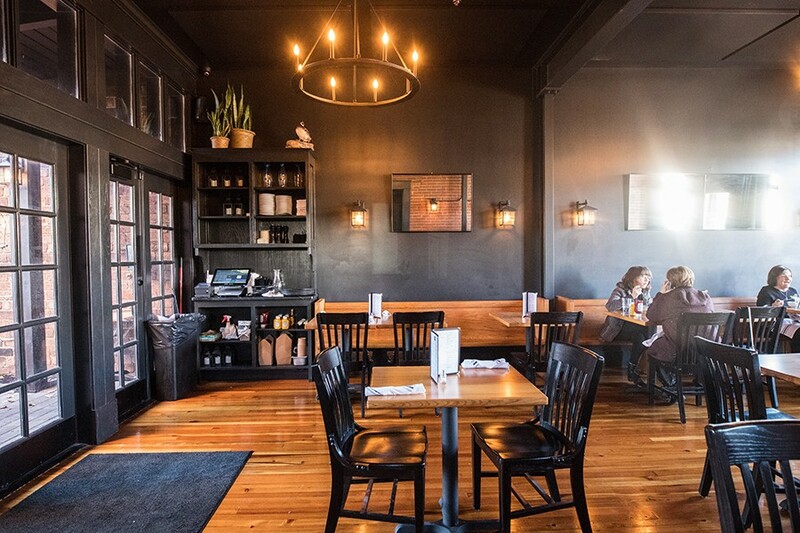 Barr and Hall-Barr's knack for design is apparent in the space; the restaurant is positively handsome, outfitted in exposed brick, black slate paint, wrought-iron chandeliers and a black tin ceiling. The downstairs consists of two rooms: one containing the bar, as well as a generous number of booths and tables, and the other the main dining room. The building also has a nice-sized upstairs, set up with a lounge area that looks like someone's well-appointed living room and an additional room for seating. There is also a rooftop patio and a ground-floor patio out back that is centered around an inviting fireplace. That all the space was not only filled, but with an hour-plus wait on a wintry Thursday night, shows that the husband-and-wife team is onto something. The packed house has a downside. The restaurant is deafeningly noisy, to the point that you have to shout at your dining companions, even if they are right across the table. I felt sorry for our servers, who will probably have to be treated for vocal-cord polyps after a few months of working here. The bar is a great place to grab a drink ... if you can get a seat. But if the pair hit the right note with the aesthetic, they prove equally adeptly with the food. Drawing inspiration from classic Midwestern comfort food, as well as some of the dishes they enjoy while visiting Hall-Barr's family in northern Michigan, they created a menu that never ventures from being accessible but is still interesting. A simple pretzel is the perfect blend of chewy and soft, properly salted and buttery, and paired with beer-cheese sauce that might as well be the nectar of the gods. The beer-infused cheese has a slight tang to cut through the richness, but not so much that it takes away from its velvety texture. It's perfection of the form. Chicken wings are equally riveting. 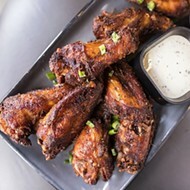 The plump wings and drummies are succulent and gently kissed with smoke; black-peppery seasoning fuses with their caramelized skin. You might be tempted to skip any condiments, but the Peruvian dipping sauce, which tastes like a verdant, cilantro-spiked ranch, is too good to pass up. The giant Cornish pasty evokes a piping hot McDonald's apple pie, only with savory instead of fruit filling. The Frisco Barroom successfully veers into less-ubiquitous bar food as well. A massive Cornish pasty (about the size of a calzone) is a flawless, savory handpie. The outside crust, which has the flavor and texture of a buttery, deep-fried biscuit, is soft in the middle and pie-crust crisp around the edges. Encased in this golden-brown pillow is a mouthwatering mixture of ground beef, potato, rutabaga and onion laced with rich brown gravy. The effect is similar to the goo factor you get when you bit into a searing-hot McDonald's apple pie, only this is a savory gravy-and-beef one instead of one filled with fruit. It's like eating a pot pie with your hands. A pierogi stuffed with fresh farmers cheese is an unexpected pleasure. Lemon zest spikes the rich cheese, making it surprisingly floral and bright. The large, half-moon-shaped dumpling, dripping in brown butter, is served with a side of Civil Alchemy's proprietary cinnamon-maple syrup; the pairing gives the dish the sort of sweet and nutty notes you get from a cheese Danish. It's delightful. In addition to the a la carte appetizers, the Frisco Barroom serves a handful of boards, consisting of everything from preserves and smoked whitefish dip (a wonderful, creamy and smoke-laden concoction) to mushroom-walnut pate and raspberry geranium jam. 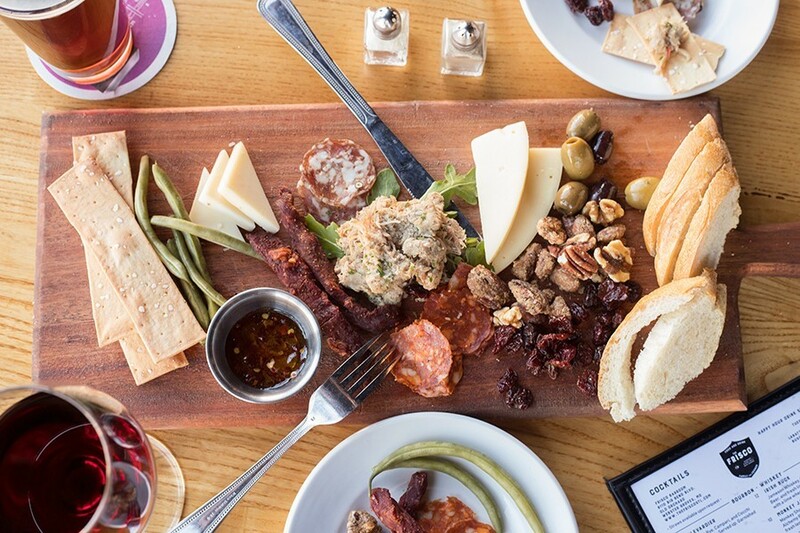 We chose the "Farmer's Board" with its fennel-flecked Italian sausage, housemade beef jerky, fontina and asiago cheese and assorted accoutrements, including dried cherries and olives. The accompanying pork-belly rillettes had an overpowering gamey funk that made them the least favorite component of an otherwise successful assortment. Frisco Barroom's double burger is topped with cheese, lettuce, tomato, onion, pickle and mustard relish. Sandwiches are the expected offerings, but successful. A reuben pairs house-cured corned beef with sharp gruyere, Thousand Island dressing and pleasantly crunchy, rustic cut sauerkraut. Burgers are smashed style, though they are heftier than others in the genre. 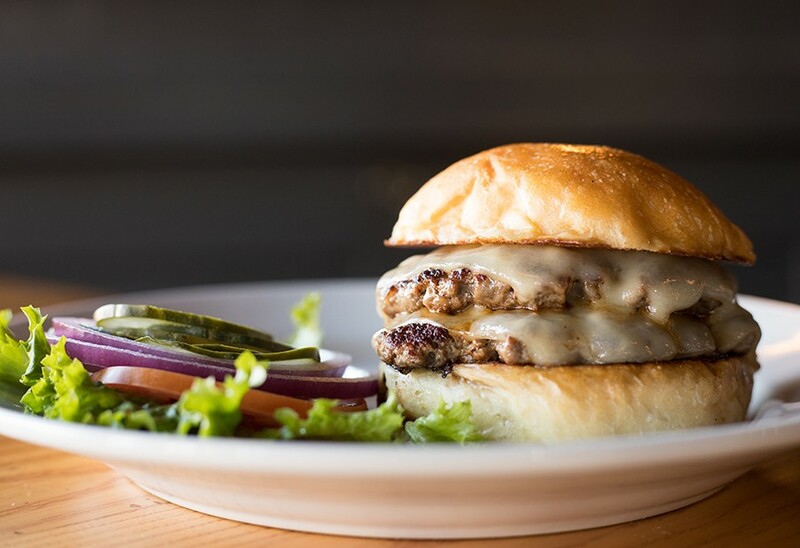 Freshly ground and covered with molten American cheese and housemade pickles, they hit the mark. Housemade salsiccia is snappy and spiked with fennel; the sausage is placed on a pillow-soft bun and smothered in fiery giardiniera for a wonderful Italian-American-inspired dish. Even a simple grilled cheese is anything but when made from gouda, cheddar and American cheese and adorned with crisp green apples and bacon. 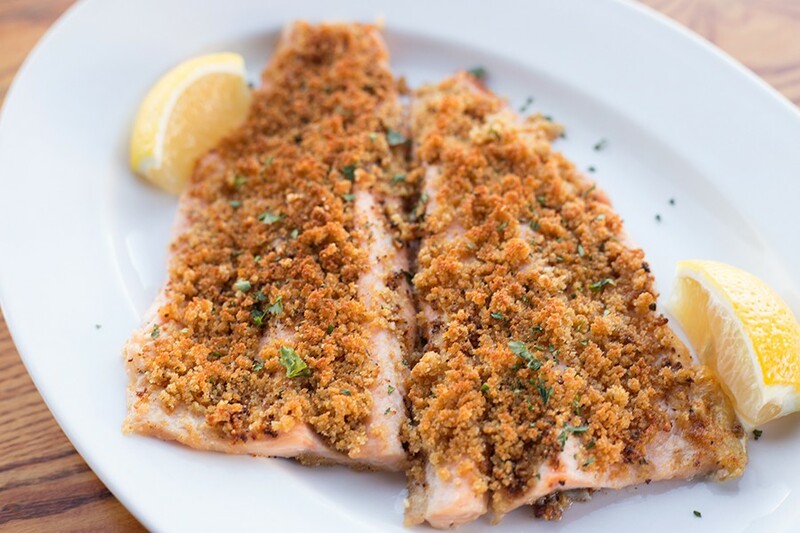 The broiled rainbow trout is topped with Lee St. breading: bread crumbs, Parmesan, garlic and parsley. 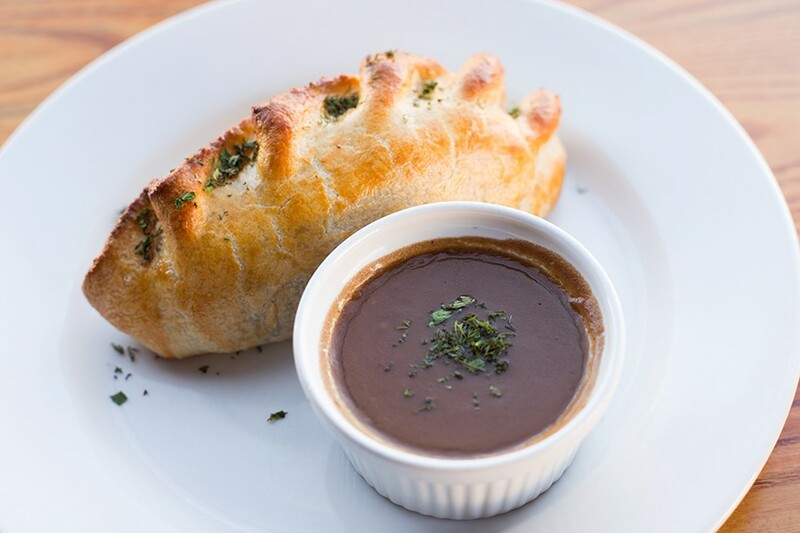 Like sandwiches, the entrees here do not break the mold but are well prepared and tick off what you are looking for at an approachable gastropub. Shrimp, marinated with lemon, white wine, butter and garlic, are masterfully grilled so that they remain tender and juicy; the shellfish soak up just a touch of grill char without it overpowering their delicate flavor. The kitchen again demonstrates its seafood prowess on its rainbow trout. The skinned and de-boned fish is coated in a seasoned Parmesan-and-breadcrumb mixture that is more than a dusting but less than a full-fledged breading. It gives the flawlessly cooked fish welcome texture without taking away from its flavor. Even better, the fish is paired with a side of the cheesy potato casserole, a glorious, cornflake-covered throwback to the family reunions of my youth. Desserts include a standard key lime pie and a chocolate pecan pie that unfortunately lacked flavor. Perhaps the decadent chocolate torte sharing the menu soaked it all up — the melt-in-the-mouth, fudgy confection is chocolate that's bolded, underlined and in all caps. You can't go wrong with a good chocolate cake. Or a juicy burger. Or some well-executed chicken wings. "Familiar food in a cheerful comfortable environment" is more than the tagline at Frisco Barroom; it's the very reason the place exists. It may have taken a while for Webster Groves to get the restaurant it needed, but if the Barroom's solid food — and roaring success— are any indication, it's going to enjoy filling that void for years to come.